Motherhood Imperfected: The time I lived without a kitchen. The time I lived without a kitchen. 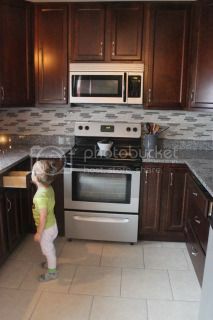 I lived through a kitchen remodel with two kids. I can say that. On that note, regardless of what happens and how much I love how it looks now, I'm not sure I would go through that again! It was rough! I'm not sure what was harder, the constant crap lying around that usually was stored in the kitchen, having my coffee maker in my living room or having to do dishes in the bathroom! Doing dishes? I will just say, I'm so thankful for modern conveniences! Oh, way back when Ben was not even 2 month old, we had a pipe break in our kitchen. Ugh. Not cool. Not fun to wake up to. I didn't think it was that big of a deal, till I noticed our nice beautiful hardwood floor that wasn't even three years old, buckled and warped. All I could think of was one dirty word, MOLD. Yep. I think of those things. Four months later, we have a new kitchen. Who knew that ordering cabinets and counters was such a process. I swear it took FOREVER. Here is the crappy before pictures. Yep, I feel the need to let you know this. My kitchen is not this messy EVER. I would die. If there is one room in the house that is always clean, it's my kitchen. Dishes in the sink gives me anxiety. Anyway, back to this mess. We had to clear it all out FAST....as in it was 8:00 pm and it was all being ripped out in the am. So, it wasn't a pretty or organized process. I will say how badly I regretted that from then on. I couldn't find anything. I still have things I can't figure out where the heck they went or and have boxes in the garage I don't have time to sort through. 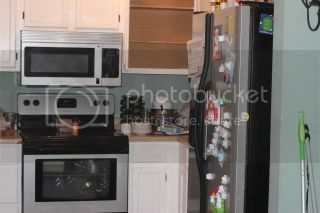 It's not easy to see here but the wall that the fridge was jammed into was knocked down and brought out a few inches. This literally was a few inches and gave me what I needed, a pantry! In this process, I only wanted two things. 1. More space. Our house is stuffed to the brims with baby and kid stuff and our kitchen, well, it's small. No cabinet space. Tall or large things? Ha. No room. There is no drawer space either. 2. A pantry. My coat closet down the hall was my makeshift pantry. How sad is that? I wanted a real life pantry. Ok, I lied. I wanted it to be pretty! 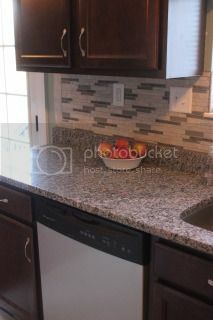 The cabinets were just hideous. I had painted them after we got married and it helped but they were falling apart in some places and my paint job could have been better. We boosted up the cabinets from 30' to 42'! 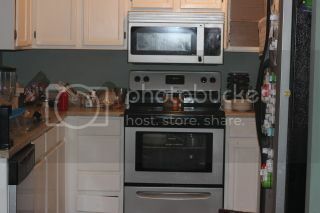 We never used the top of the cabinets for any decorative reasons anyway and we could use the storage space. It was one of the best decisions and where I put the things I never use. I originally wanted a dark floor but I am so glad we went with the lighter floor. It lightens and makes the space look so much bigger! We squeezed the pantry in on the right side and built the fridge so it didn't stick out. Another perk? 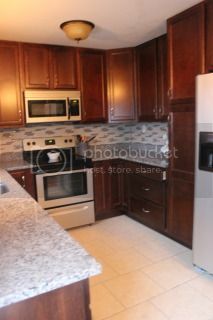 The cabinets above the fridge line up with the edge of the fridge! I can reach them! It's the small things, people. 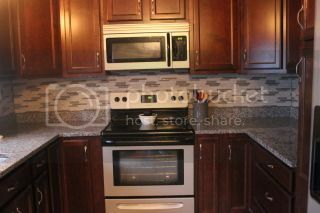 The backsplash was a last minute add on and I have to say, it makes the whole kitchen. I am just in love with it and it brings it all together. 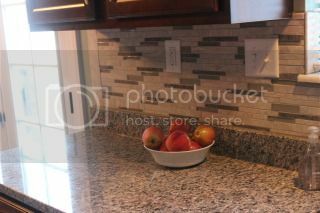 I never knew you could love tile so much! The new sink is amazing too. Who knew what I was missing out on with an under mount huh? It's life changing and I do dishes with a smile. Most of the time, that is. I wish I had thought of taking a bit more pictures before it was all ripped out but I have to tell you about our sink. If I hated something in that kitchen, the sink was it. The facet? Oh, my word. Well, it's actually one. Wood-grain. Yep. Wood-grain on the facet handles. I think I shed a tear when it was ripped out. Don't worry, they were tears of pure joy! [url=http://www.canadagoosehommes.com]canada goose vest[/url] several yards)1/8 to 1/4' adapterColossal iSoniTalk apple company iphone allowed headphone cable connection, Blackberry and various songs telephonesRigid Vacation circumstanceColossal Fresh Towel by using superior Aegis Microorganisms Face shield technologies. Here is the deal though it's not that you can't expect too much its just that you have to know what you are getting yourself into. [url=http://www.londongenuinepandora.com]pandora outlet[/url] wife Almost historical picture of a map of nevada of which sara winnemucca impacted. Some of the more popular types of accessories include;. Another choice is the hobo stove, which is also made from a can and uses pine cones and sticks for fuel.. Your goal will be to make it easy for people to find your company when they search for key phrases related to your goods and services.. [url=http://www.soldesgoosefr.com]Canada Goose Chateau Parka[/url] These are often full of all kinds of fashion tips and advice as well as beauty tips.